Internet of Things Trends in the Manufacturing Industry | 2018 : Consolidated Technologies, Inc.
Smart technology is increasingly being incorporated across industries, and the manufacturing industry is no exception. 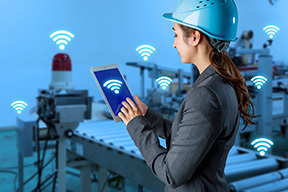 The Internet of Things (IoT) has become an enormous resource for factories, providing an information network that delivers automation, analytics and real-time decision-making capabilities to the manufacturing floor. In fact, nearly a third (31%) of production processes and equipment and 30% of non-production processes and equipment already make use of this technology. The result is a manufacturing system that enables full visibility across factory operations, streamlining systems throughout. So how exactly is IoT utilized in the manufacturing industry? 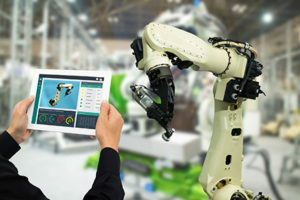 Here are eight of the most significant IoT trends in manufacturing to be aware of and the effects they have on the industry. Sensors are utilized across the manufacturing industry, in everything from identification tags to production equipment. Collecting all types of data, sensors feed data into factories’ analytics systems, tracking everything from access logs to vibrations. As a specific example, Radio Frequency Identification (RFID) tags are a type of sensor commonly attached to things in the manufacturing industry, including name tags, product containers and other objects, helping keep track of employees and assets as they move through the production line. The effect is more control of the production process as a whole, allowing managers to identify and prevent issues that can cause defects or downtime and improve yield and productivity. 3-D printing capabilities are becoming more extensive as the technology has expanded, and now it is a significant part of the manufacturing industry. This technology can produce virtually any object without retooling needs, enabling factories to build parts for clients and themselves efficiently while reducing costs. Digital representations of physical objects and systems are a well-established idea, but when married with analytics and real-time data, they can be powerful tools for manufacturing. Digital twins help to model systems and identify the potential outcomes of maintenance protocols before they take place, reducing downtime and costs. Swarm intelligence is the process of collecting information from across many sources and using analytics to create actionable insights. 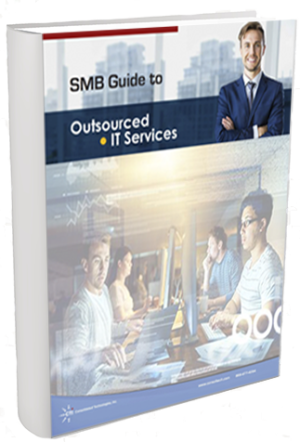 For the manufacturing industry, specifically, this can be used to analyze the manufacturing processes as they take place, identify bottlenecks and optimize operations to keep production flowing. Though artificial intelligence is a hot topic, it is growing in adoption across industries. In the manufacturing industry, specifically, artificial intelligence is a powerful tool for predictive maintenance, collecting and interpreting vast amounts of data, recognizing patterns and making recommendations before a piece of equipment fails. In the future, many expect AI to take an increasing role on the manufacturing floor itself, performing hazardous jobs to minimize employee injuries and increase efficiency. Self-governed machines are becoming increasingly useful in the manufacturing world, assisted by AI to respond to their environment in real-time using sensors and motor control. 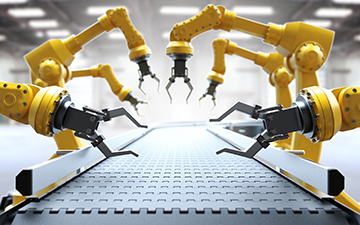 These autonomous systems help factories improve agility and operational efficiency, and many expect it to take a more significant role on factory floors over time. Robotics is a huge part of the manufacturing industry, and they’ve only become more advanced over time. Networks of robots can collaborate and communicate, adapting to changing conditions more efficiently. These “cobots” are expected to become more integrated in manufacturing over time, taking over hazardous tasks that could pose safety risks to humans. While virtual reality replaces a user’s vision with a virtual environment, augmented reality adds to the viewer’s existing surroundings with a layer of digital content. While this is most commonly associated with the entertainment industry, the manufacturing industry can benefit from this technology as well, allowing workers to get real-time information and instructions regarding the equipment around them while still keeping their hands free. IoT for the manufacturing industry is becoming ever more essential, which is why it’s important to stay on top of the latest trends. Integrating the right IoT solution into your business plan can help improve productivity and give your organization a competitive advantage. Consolidated Technologies, Inc. can help you find the best solution for your business. We’ll work with you to discover your needs and craft a targeted solution, using our extensive technical knowledge of the IT world. Contact us today to learn more about how we can help you find the solution you need.